The author of this book has long had an interest for the lives of the missionaries sent out into the world by the Rhenish Missionary Society (RMS) since 1928. 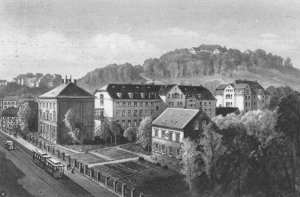 At the Archives and Museum Foundation of the United Evagelical Mission (UIM) in Wuppertal – the follower of the RMS – she kept finding, among the numerous authentic documents, accounts of the children of these missionaries. Often times they were sent back to Germany at an age as young as five. What had been happening with these children since the middle of the 19th century up until the Second World War? What were their lives like in their so-called home without parents or relatives? Since about 1850 central administration and the missionaries themselves were in agreement about the dire need of their children for qualified schooling and education and that this would only be accessible to them in their German homeland. In the following decades almost all missionary families sent their children at a young age to Germany. For those without relatives to stay with, the Rhenish Missionary Society provided homes all over what is today the federal state of North Rhine-Westphalia. In the first chapter of this book the author illustrates the reasoning and purpose behind the construction of these homes, followed by the history of the specific institutions. After growing up with their parents in their respective missionary stations, being sent home was a drastic cut in the lives of these children. What they had to expect in their home country so strange to them is the topic of chapter III. Using reliable sources provided by those concerned, chapter IV sheds some light on the role of the foster parents in the homes, whereas the fifth chapter concentrates on the might and plight of the biological parents. The documents presented also concern themselves with the further lives of the children leaving their homes after reaching adulthood; their stories are portrayed in chapter VI. The closing seventh chapter finally discusses the benefits and drawbacks these homes presented to the missionary children. As in her earlier work Seine ‘Gehülfin” – Wirken und Bewährung deutscher Missionarsfrauen in Indonesien 1865–1930 (see link below) relating the role played by missionary wives, the author here reveals a social concern rarely mentioned in missionary history.